Situational awareness: UK competition regulator says the 21st Century Fox takeover of Sky News is not in the public best interest because of fair competition concerns. ICYMI: Comcast-NBC merger conditions expired on Saturday, just a few weeks before the largely-anticipated AT&T-Time Warner DOJ case. Now, some are worried about anti-competition problems. Telecom companies like AT&T and Verizon are racing into the digital advertising space — currently dominated by Google and Facebook — now that Washington has given them the ability to sell data to third-party advertisers. Why it matters: The growth rate in the digital ad market is expected to decrease over the next four years, according to eMarketer, meaning that any market share internet service providers are able to gain will eventually come at the expense of other advertising-based businesses, mainly Google and Facebook. AT&T's proposed merger with Time Warner will be a linchpin in the battle between internet companies and the web firms that rely on their services. If the merger survives the Department of Justice challenge, AT&T and Verizon — two of the largest internet companies in the U.S. — could collectively put a dent in Google and Facebook's advertising dominance. “What a lot of people don’t understand — and frankly this is what I think the government is missing as it relates to looking at these mergers in a backward-looking way — is we’re competing in the land of the giants... If you don’t think Facebook and Google and Amazon are the land of the giants, think again." Conservative regulators are seizing on this rationale as they pull up telecom regulations, arguing that empowering legacy telecom companies could be an way to curb the dominance of the duopoly. FCC's commissioner Michael O'Rielly, one of the agency's Republican members, told reporters on Monday that lifting regulations on internet service providers was the right way to grapple with the growing influence of Google and Facebook. The commission's Republican chairman, Ajit Pai, said last year that web giants were advocating against his net neutrality repeal to use "the regulatory process to cement their dominance in the Internet economy," adding that "the government shouldn’t aid and abet this effort." The effort to free up ISPs to use data for ad targeting goes as far back as March, when lawmakers voted to roll back privacy rules that covered their customer data. 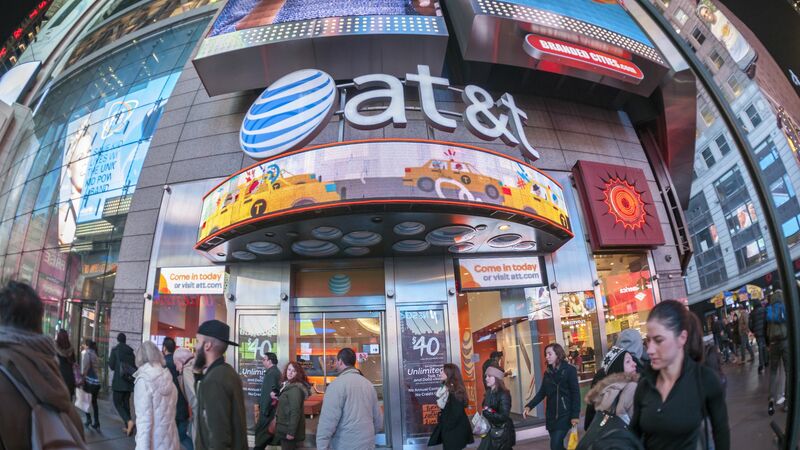 AT&T and Verizon have taken major steps to take advantage of the regulatory environment that will allow them to dive deep in the ad business. Both companies are using brand safety as a major pitch to lure advertisers to their advertising platforms. Go deeper: More from Axios' David McCabe and I in the Axios stream. Digital publishers are fed up with Google and Facebook hosting their content without paying for it. Several are calling for, or predicting, a relationship between web platforms and digital content providers that mimics the carriage relationships between TV networks and cable and satellite companies. Why it matters: Platforms are looking to host more premium content, especially long-form video, as people migrate away from traditional TV. Their push for those ad dollars is empowering content creators with video expertise to demand premiums for the content they can provide. Bottom line: The pendulum is swinging in content companies' favor. Rupert Murdoch, CEO of News Corp and 21st Century Fox, in a statement on Monday: "Carriage payments would have a minor impact on Facebook’s profits but a major impact on the prospects for publishers and journalists," Murdoch wrote in a statement. Henry Blodget, CEO of Business Insider, to Axios on Thursday: "The way [social media platforms] interact together I would suggest is the same way that cable TV companies and cable programmers interacted. You had to build the cable connections first, then you had to add the content on top of it. And ultimately, they are very symbiotic," he said in an interview AdExchanger's conference. Ben Lerer, CEO of Group Nine Media, to Axios on Monday: "The mechanism of having premium publishers participate in more meaningful way is absolutely coming. Inevitably, it will be in Facebook's best interest to support great content because it's a requirement for any kind of ad product they need to build around premium video." A rise in disputes over carriage fees — which are becoming more and more expensive as content costs increase — are causing the number of TV blackouts to skyrocket, meaning consumers sometimes can't access their favorite shows. According to the American Television Alliance, 2017 was the worst year for TV blackouts on record — with more than twice as many as the year before. Trust in traditional journalism online has reached a six-year high while trust in social media and search engines has reached a near six-year low, according to the latest Edelman Trust Barometer — an annual survey that looks at global trust in media, business and government. Why it matters: The survey results reflect a global reckoning around fake news and misinformation, which has intensified over the past year as automated tech platforms have come to dominate news distribution and consumption. "This is a very important opportunity for media companies devoted to informing the general public." Edelman CEO Richard Edelman tells Axios' Mike Allen. Trust in platforms has decreased in 21 of 28 countries surveyed. The irony is that while trust in social media for news sources wanes, technology remains the most trusted industry sector, according to the study. Why it matters: As more people increasingly get news and information about elections on social media and as more election dollars shift to digital, the stakes are higher for these companies to ensure they are prime destinations for political advertisers and safe destinations for consumers. Google and YouTube chief executives pledged to monitor videos and other content more closely for misleading news and inappropriate messages on their web services ahead of elections in the U.S later this year, Bloomberg reports. Facebook says it has a "moral duty" to fix risks of platform abuse heading into 2018. In a blog post Monday, Facebook Civic Engagement Product Manager Samidh Chakrabarti says: "We’re working diligently to neutralize these risks now." Google, Facebook and Twitter have announced ad transparency efforts ahead of the midterms, including updated ad disclosure and ad targeting rules. Executives are becoming more vocal in addressing questions around election integrity. Note: Steve Passwaiter of Kantar/CMAG says that with all of the retirements of senior House members, the projections in the chart above may even turn out to be "a little conservative." Netflix blew past investor expectations Monday, adding more subscribers and revenue than expected and plans to spend more on content than ever before. But, the company said it lost $39 million for content that was not released. Netflix CFO David Wells said on the company's earnings video that a write-down of this magnitude was “related to the societal reset around sexual harassment." The numbers also shows how much bigger Netflix's subscriber base continues to grow compared to Amazon and Hulu, it's biggest on-demand rivals. The company says it plans to spend up to $8 billion on content in 2018, up from roughly $7 billion in 2017. Free cash flow will dip to negative $3-$4 billion in 2018 compared to negative $2 billion in 2017. The company also plans to spend $2 billion on marketing in 2018 to get more people to subscribe, up from $1.3 billion spent in 2017. Axios' Zachary Basu and I have more in the stream. DuckDuckGo started a decade ago as a privacy-friendly search engine alternative to Google that doesn't collect your personal information. Now, facing the data-collection dominance of Facebook and Google, it's seeing anonymous searching spike and is expanding beyond the search box, Axios' Kim Hart writes. Why it matters: Google and Facebook track individuals' online behavior to tailor advertising based on those preferences. With data breaches on the rise, along with concerns over election manipulation through targeted ads, smaller firms who want to offer an alternative to how the tech giants do business are gaining traction. DuckDuckGo, in particular, is pitching itself as an "internet privacy company" by launching encrypted private browsing that blocks trackers. Growing interest: DuckDuckGo founder and CEO Gabriel Weinberg said he first saw an increase in traffic after Edward Snowden leaked NSA documents in 2013.